On Tuesday, August 28, 1979, the Milwaukee Brewers were taking on the Royals in Kansas City when when they ran right into what the Milwaukee Sentinel called a "double play with comic overtones" that "would have stolen the show in a Marx Brothers comedy." With Cecil Cooper on second and Gorman Thomas on first, Ben Ogilve lined a double off the wall in right center. Thomas, running at fill tilt, was almost at second when Cooper left the bag. By the time they reached third base, the two were only about two steps apart. Milwaukee third base coach Buck Rodgers, unable to send Cooper but hold Thomas, waved both of them home, where they were both tagged out. By a mile. Next time do it right! When two Milwaukee base runners try to score on the same play, they don't necessarily have to be out. 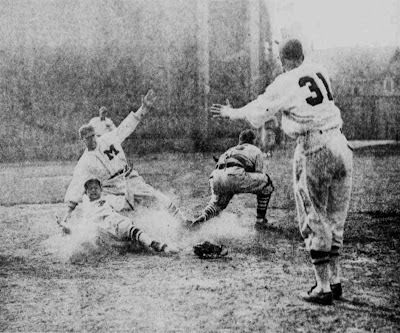 Former Sentinel photographer Frank Stanfield recorded a successful double-sliding score in 1936 by the old Milwaukee Brewers of the American Association. 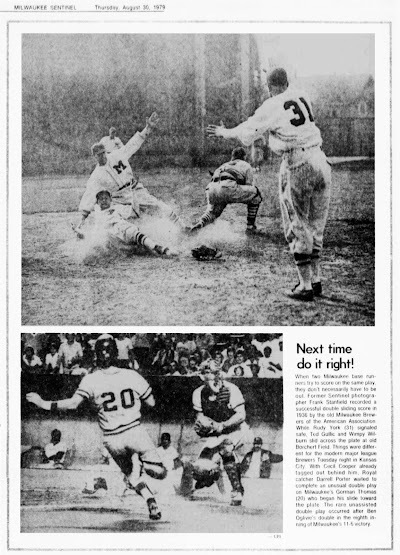 While Rudy York (31) signaled safe, Ted Gullic and Wimpy Wilburn slid across the plate at old Borchert Field. Things were different for the modern major league Brewers Tuesday night in Kansas City. 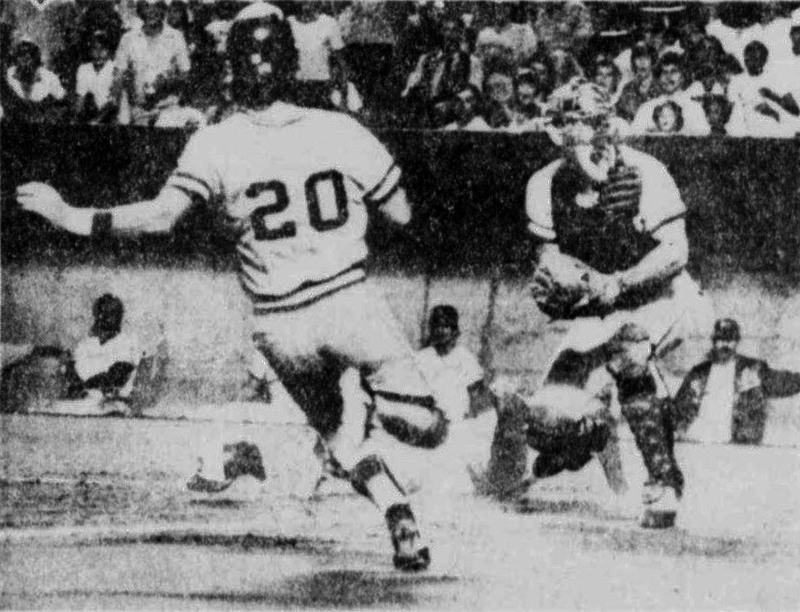 With Cecil Cooper already tagged out behind him, Royal catcher Darrell Porter waited to complete an unusual double play on Milwaukee's Gorman Thomas (20) who began his slide toward the plate. 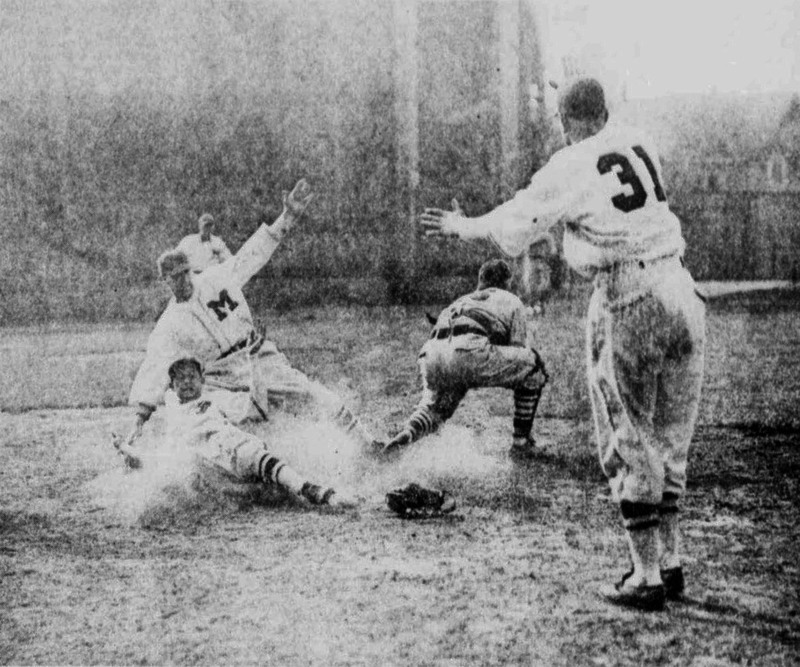 The rare unassisted double play occurred after Ben Oglive's double in the eighth inning of Milwaukee's 11-6 victory. Outstanding. You have to admire such an appreciation for history. Love the bold numbers on Rudy York's uniform, although they seem to dwarf the monogram on the front. York was a first baseman who spent most of his career in the bigs. Out of his eighteen years in baseball, thirteen were spent in the major leagues, most with the Detroit Tigers. Detroit had a working arrangement with the Brewers in those days, not the outright affiliation you see today but an agreement where Detroit would have first crack at buying Milwaukee's players and could option some of their own to the Brewers for seasoning. York spent spring training in 1936 at the Tigers' camp in Sacramento but was in Milwaukee by Opening Day. He was the team's key slugger that season, hitting .334 and leading the Brews in hits, triples and home runs (207, 21 and 37, respectively). That performance was good enough to earn York a roster spot at Navin Field, where he made himself at home for the next nine years. The wonderfully-nicknamed Chester (Wimpy) Wilburn had a similarly brief career at the Orchard. He came to Milwaukee from the Portland Beavers, Detroit's farm club in the Pacific Coast League. At the end of the season, the Tigers cancelled the working agreement they had with the Brewers and recalled Wilburn, sending him to the Baltimore Orioles. Wilburn spent the next several years trying to secure his release from the Tigers so he could rejoin the Brewers. If York and Wilburn were mere guest stars in Milwaukee, Ted Gullic was a leading man. A Brewer since 1931, he was already a veteran of the Orchard when the other two men arrived and he stayed long after they left. Gullic went on to prowl the vast expance of Borchert Field's outfield through 1942, when team president Bill Veeck sent the fan-favorite team captain to Portland for PCL home run champ Ted Norbert. Those three careers only overlapped in Milwaukee for one season, but what a season it was. The hard-hitting 1936 Brewers ended the season with 90 wins and 64 losses, taking the the American Association pennant by five games for the Cream City's first championship since 1914. The Brewers then steamrollered through the Association playoffs and and defeated the Buffalo Bisons in the Junior World Series, 4 games to 1, to reign as kings of the minor leagues. It was one of the finest teams ever to play baseball in Milwaukee. Asked after the game in 1979, manager George Bamberger told reporters "You have to watch out for the man ahead of you. Gorman was overhustling. Look, I'm not trying to degrade him. I'm complimenting him for his hustle, but he just has to be a little more careful." Thomas, for his part, was quoted as saying "I'd rather overhustle than underhustle. As long as I play hard, nobody's going to blame me." Certainly nobody in Milwaukee, where he remains beloved to this day. I suspect Stormin' Gorman's brand of hard-nosed baseball would have gone over very well with the boys on that 1936 Brewer squad. Today in 1913 - Milwaukee's "Men of the Hour"